From a single blank of pohutukawa, make this two-part body and stand to hold a small, stylish insert clock. Here is a stylish 36mm small clock, inserted into a 50mm sphere and placed on a tapered stand which you can make easily with your woodturning lathe. I enjoy making these clocks and sell them for $40 each, but otherwise I create them just for the pleasure of pursuing my hobby. For this clock, I used pohutukawa wood. I like the density of its colour and the rich ﬁnish. I set the lathe at about 1800 revs for this project. All grooves and spigots are cut to depth using calipers. “Left” and “right” refer to my view as I face the lathe. The blank should be cut about 55mm square by about 160mm long in the grain direction. Mark a centre at one end and place the blank in a 50mm scroll chuck with the centred end out. Bring the live centre up to the marked point and apply a little force against the chuck. Tighten the chuck. Rough the tailstock end to a cylinder with a roughing-out gouge, then cut a spigot about 48mm wide and 5mm deep. 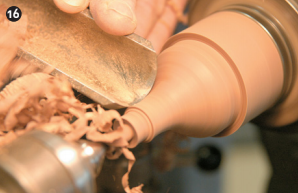 (1) Reverse the blank in the chuck, start the lathe and form a small dimple to mark the centre. Bring up the live centre and apply a little force. Rough out the remainder of the blank to a cylinder. 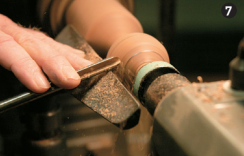 Using a parting tool, cut grooves to 51mm to set the required diameter. 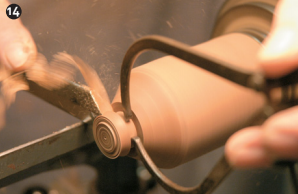 (2) Turn the block to a 51mm diameter cylinder, to allow for some ﬁnishing and sanding. I work from an octagon, with each of the eight sides 0.4142 x the diameter of the circle. So, for a 50mm sphere, I need to cut eight sides each 20.7mm in length – 21mm will be near enough. I’m making a clock body so I don’t need watch precision. Next cut a thin spigot 21mm in diameter on the tailstock end. (3) Square up the face of the cylinder. Now, mark the cylinder from the squared end at 50mm and 25mm, then 10.5mm each side of the 25mm mark. Using the tool rest as a steady, hold the pencil against each mark and turn the chuck by hand to mark all the way round. (4) Cut a groove square to the surface at the 50mm mark, down to 21mm. Cutaway waste wood on the left back 20 or 30mm from the 21mm groove to allow room to work down to the groove later. Check the 21mm diameter using Vernier calipers and check the spigot at the end at the same time. Using a small 6mm gouge, now cut from the 10.5mm marks in a straight chamfer down to the 21mm spigot, and to the groove. (5) There will now be three faces of 21mm. Now put a mark at 10.5mm i.e. half way down the newly cut chamfers and mark a complete circle by turning the lathe. 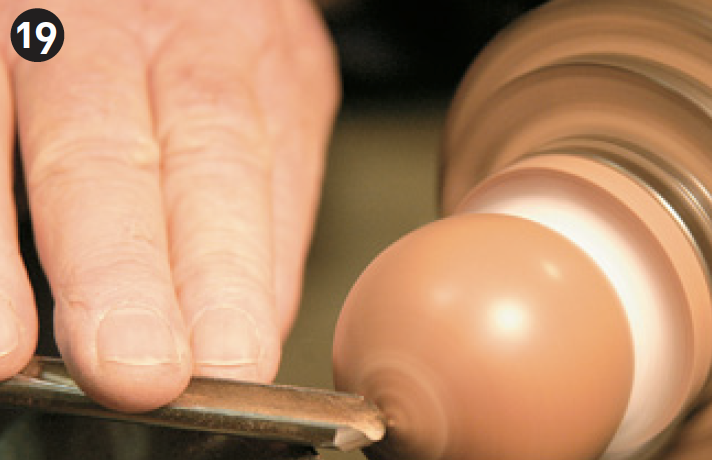 (6) I use a 6mm gouge to round the areas between the pencil marks to form part of the sphere. (8) Any proud areas will immediately show as lightly burnt circles. These marks can be trimmed off and the process repeated. Your ﬁngers can tell you if it’s regular and smooth as the wood spins. Still with the tailstock in place, using a parting tool, part off from just to the right of the right-hand line then back off the tailstock. This surface can be squared using the curved edge of a diamond parting tool. This supplies a ﬂ at surface of about 35mm for the Forstner bit. Cut a small dimple in the centre as a lead in for the bit. The clock inserts I use take a 1 3/8 inch-wide hole (34.9mm). There are small differences in the required hole size for different makes of clock. Using a Jacob’s chuck in the tailstock, at about 250 revs, bore a 1 3/8 inch-wide hole 10mm into the wood with a Forstner bit. (9) (That is 4 turns of the hand wheel on a DVR lathe.) Back off the tailstock and remove the Jacob’s chuck. A face of about 1mm is cut with the edge of a parting chisel at the rim of the clock body and the insert clock tried for ﬁ t. Check with the clock in – it’s not the time tofind out it doesn’t ﬁ t when the turning is finished. (10) Now I use a diamond parting tool to continue the left hand form towards the centre of the body. Keep checking with the burner here to keep the spherical form. Take the curve past the 21mm diameter to about 10mm. This will allow support for the sanding. (11) Keep checking and trimming until the burner is a good ﬁ t around its complete circle. I like to use a cabinetmaker’s scraper, a handy tool for smoothing these curves because you can get a sweeping movement. There could still be some minor irregularities but these can be removed using a 100-grit “gouge” (sandpaper) at slow speed. Next step is sanding. This must be done slowly or heat cracks will be created and these are impossible to remove. I use about 300 rpm for this, depending on the wood. Sand as far round the sphere as possible. The big thing is to do it slowly. (12) It is essential to ensure that all marks from previous grits are removed before going a step further. Spotting these marks is easier if alternate grits are moved slowly across the surface, then the next moved quickly from edge to edge. Then any regular concentric marks from the previous grit will be seen and vice versa. I use 100, 120, 150, 180, 220, 280, 320, 400, 600, 800, 1200, 1500, 2000 and then buff with brown Kraft paper. From the 1500 on I use a higher speed, about 2000 rpm. The 150 and 280 grits are probably superﬂuous. If you see concentric marks around the diameter of the sphere, then you haven’t done the sanding thoroughly enough. Parting off comes next. Care must be taken to leave a little more wood than necessary (rather than risk over-cutting) as this will be removed later. (13) The remaining stock is used for the foot, or the stand. I try to make this about 50mm high with a base of about 40-45mm. First, a spigot of 8mm diameter by about 10mm or so deep needs to be cut at the top. (14) Use the Vernier calipers to gauge this. Trim gradually – check the spigot diameter by pushing the spigot into an 8mm hole drilled into a piece of waste. Using the tip of a small skew chisel, undercut the shoulder of this spigot to allow it to make a snug ﬁ t with the clock body. (15) The bottom of the stand is marked, say, 50mm from the spigot shoulder and turned down to the required diameter. 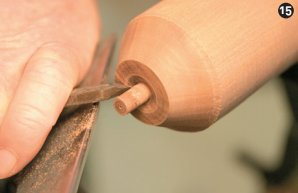 Using the tip of a skew chisel, make a cut around the bottom to stop any chipping when parting off. I use a roughing-out gouge then a 6mm bowl gouge to shape the base. Most people would use a spindle gouge here. Turn the base to the desired shape. (16) Start parting the cut-off to about 10mm deep to allow the edge of the base to be sanded. Next, the stand is turned to the desired shape. A good diameter for the top shoulder seems to be about 12mm, and there should be a small waisted area below the spigot shoulder. Sand the stand as for the body. If using friction polish, do this now. Now cut the stand off making sure to have the base slightly concave. The better the surface here, the easier the ﬁ nal sanding. Using a sharp carpenter’s chisel, pare any proud waste from the bottom. Great care is needed here to ensure there is no resultant blood. Put aside to sand later. (17) The back of the clock body now needs to be ﬁnished. The stock remaining on the lathe is used to make a jam-ﬁ t plug to hold the clock body while ﬁnishing the back. Make the jam-ﬁ t plug 35mm diameter and about 15mm deep to hold the clock body for this. I bore an 8mm hole right through this so that, if the clock is jammed tight a knock-out bar can be used through the chuck to remove it. This 8mm hole can also be used to hold the foot for polishing if using Danish Oil. Square the end of this. (18) The clock must be held very ﬁrmly – use a little tissue paper in the jam chuck to tighten it up if necessary. Have the tool rest at about 60 degrees to the lathe ways and close to the body of the clock. Check the stationary clock body for roundness using the wooden burner. Note where the wood needs to be removed and very carefully cut it away. (19) A catch here is bad news. If there is only a little to be removed, I often use the curved edge of a diamond parting tool for this. Sand the area which has been tooled the same way as earlier. With each grit, take the sanded edge a little further to the centre. 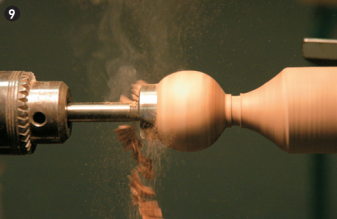 For the last few grits, reverse the lathe so that sanding is done in the same direction as earlier. If using friction polish, do this now, but leave the next steps till next day for the polish to harden. (20) The body of the clock bowl now has to be drilled with an 8mm hole a little deeper than the spigot. I have a homemade compression chuck to ﬁ t in the scroll chuck for this operation. I clamp the clock body in the desired position in the compression chuck with the clock hole angled upwards, then place this in the scroll chuck. Using a slow speed (about 250- 300rpm), I slowly bore a hole to a depth a little greater than the base spigot. (21) A brad point bit is best for this. Now put the Jacob’s chuck in the headstock and using a 50mm rubber sanding mandrel, sand the bottom of the base through the various grits from 100 to 220 or so. (22) Assemble the body and foot with a little PVA adhesive in the hole, not on the spigot. (23) Shellawax friction polish gives a nice ﬁ nish glow you can see through to the grain. I use this polish only for small objects. Our author, Bruce Hannah is a retired pulp and paper industry research project manager.